Dr. Juan José Daboub, Founding CEO of the Global Adaptation Institute (GAIN), speaks at the National Press Club during the announcement of the partnership between GAIN and the University of Notre Dame. GAIN is dedicated to enhancing the world's understanding of the urgency for adaptation to climate change and other global forces and for the support needed through private and public investments for developing countries. Climate change, population shifts and resource scarcity jeopardize the improvements made on many human development goals, particularly in developing nations. The world must adapt now, and do it in a way that harnesses human ingenuity and creativity. The Notre Dame Environmental Change Initiative’s research tackles the interrelated problems of invasive species, land use, and climate change—focusing on their synergistic impacts on water resources. ND-ECI provides new intellectual capital and infrastructure at Notre Dame for interdisciplinary teams of faculty who are spearheading innovative research programs in order to help solve complex environmental problems identified as “Grand Challenges” by the National Academy of Sciences. PovertyCure is an international network of organizations and individuals seeking to ground our common battle against global poverty in a proper understanding of the human person and society, and to encourage solutions that foster opportunity and unleash the entrepreneurial spirit that already fills the developing world. 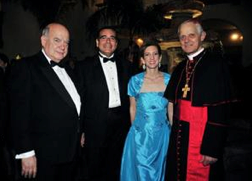 Catholic Charities is the social ministry outreach of the Archdiocese of Washington. Motivated by the Gospel message of Jesus Christ, and guided by Catholic social and moral teaching, Catholic Charities strengthens the lives of all in need by giving help that empowers and hope that lasts. To this end, it affirms and supports the dignity of all human life, strengthen families and serve the poor and most vulnerable. Catholic charity institute dedicated to people in need, especially focused in the areas of health care and education. Operation Walk is a private, not-for-profit, volunteer medical services organization which provides free surgical treatment for patients in developing countries (and occasionally in the US), that have no access to life-improving care for arthritis or other debilitating bone and joint conditions. Operation Walk also educates in-country orthopedic surgeons, nurses, physical therapists and other healthcare professionals on the most advanced treatments and surgical techniques for diseases of the hip and knee joints. This is done in conjunction with surgeries to help create a lasting contribution to patient care in developing countries. The Aspen Institute’s Center for Business Education encourages future business leaders to innovate at the intersection of corporate profits and social impacts. Our goal is bold and long-term: to radically re-orient the MBA degree to embrace the principles of corporate citizenship and sustainability. Growing the Middle is dedicated to formulating strategies for economic growth in Haiti by encouraging job creation in small- and medium-sized enterprises (SMEs). The University of Notre Dame has developed clubs throughout Latin America and the Caribbean to help parents, family and friends of the University remain connected to news and events.